Yeah, this was good. 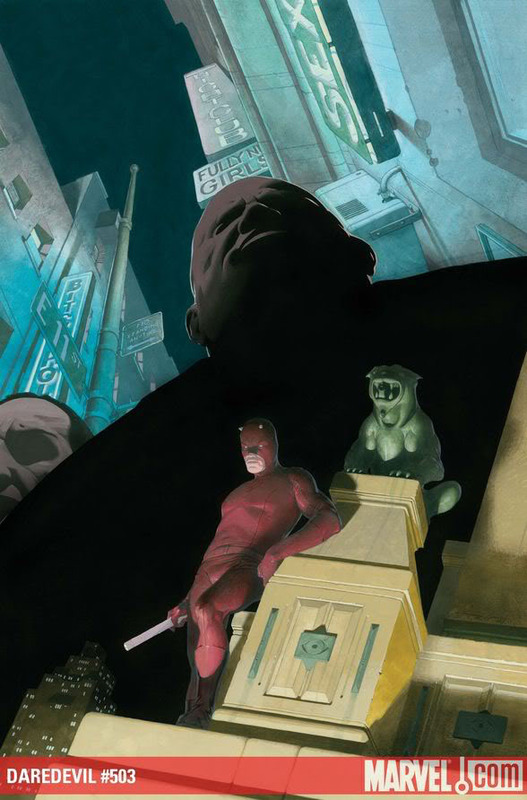 While Daredevil #502 had some of the typical qualities of a middle of the arc issue, this one sees a lot of things happening on several fronts. All good stories are driven by conflict, and in a Daredevil-leading-the-hand-while-Norman-Osborn-rules-the-world kind of setting, conflicts are all over the place, and even the regular, more grounded, cast from Matt Murdock’s civilian life are seeing the consequences of civilian disobedience. This issue seems much longer than it is. It’s got several important scenes in it which are all given enough space to develop, and every single one reveals new layers of intrigue. We have Daredevil talking it out with Master Izo, and White Tiger airing her concerns to both Daredevil, and Black Tarantula. The Kingpin is really stepping it up a notch and Detective Kurtz (at least I think that’s him) inspecting a crime scene that doesn’t make sense to him. The last scene of this issue struck me as being very similar thematically to some of the things we saw in Bendis’s King of Hell’s Kitchen story arc. Matt’s actions are more extreme here, but so are the circumstances of the Marvel Universe. I get the feeling that Andy Diggle has a firm grasp of, and an appropriate level of respect for, Daredevil continuity, and that’s crucial at this point considering how far away from the status quo we are. So far, this story arc really works for me, precisely because Diggle manages to mix the new developments with old themes that give the reader a sense of familiarity even while moving through unexplored territory. Roberto de la Torre is getting help this issue from artist Marco Checchetto, and the transitions between the two are clearly visible, though not necessarily jarring. Checchetto’s art lacks the almost dreamlike qualities that we’ve become used to with the new creative team, but feels very Daredevil appropriate (and am I the only to notice how good he is at rendering hands?). Meanwhile, de la Torre is reaching new heights, and I love the look of this book right now. I also have to give him props for restoring Becky Blake to the hottie on wheels she was in her very first appearance (before Miller turned her into a frumpy wallflower). The only thing I’m curious about is how he would draw Matt, who hasn’t been seen out of costume since the Dark Reign – The List one shot penciled by Billy Tan. All in all, this issue leaves me with a good idea of what’s going on, but no clue about what’s going to happen next, which is really exciting. What can I say, it’s a good time to be a Daredevil fan! You know the writer has thrown you for a loop when the big talking point of the issue isn’t the big talking point of the issue. (1) If Matt ordered the killing of the cops (or their induction into the Hand or whatever happened), why does he care if one anonymous Hand ninja kills himself? He’s either hard as nails and determined to take back the streets or he’s not. Pick one. (2) Foggy is still alive. Thus, Black Tarantula and White Tiger failed in their assassination mission, indicating they are not as they seem. Why has no one noticed this, i.e., why aren’t the other ninja lords onto Matt already? This is just as bad as Master Izo potentially turning up alive. Other than that though, I’m pretty much ok. And I do like Becky’s freckles. I have no idea what happened to the cops, but I’m pretty sure that Matt didn’t order that they be killed. I don’t think they were inducted into the Hand either, but I’m obviously just as clueless as the next person and I think this is just a wait and see kind of thing. I will totally agree with you about Matt (well, Diggle really) walking a thin line between doing too much and doing too little. Any writer working on Daredevil is stuck with a character whose readership is traditionally very hesitant about him crossing the line into killing. I wouldn’t honestly mind terribly myself – though that would depend on the situation – but having a character who values life above all else leading a band of assassins is kind of tricky. This will need to be addressed in a more decisive manner than we’ve seen so far, so I agree with you there. But who ordered Foggy’s assassination? Was it the Hand as an organization? Hmm. *goes to look* Okay, I just looked and was relieved that my memory didn’t completely fail me. The hit on Foggy was ordered by the Kingpin and then relayed to Lady Bullseye, so I guess this means that the whole thing was a rogue operation anyway and not something that the main organization would even care about. On the other hand (no pun intended), this brings Black Tarantula and White Tiger’s introduction into the Hand in question. Are you a proper Hand ninja if you were turned by someone with her own agenda? Who knows? I agree that there are some kinks in the story, they just don’t disturb me that much. I was much more peeved with the first lady Bullseye arc where I felt that her motives didn’t make sense. Some of that cleared up by Brubaker’s last arc, but that added additional wrinkles. Some were resolved by Daredevil #500, but some remain, for sure. I think I get my issue later than you guys do. Anyway, I’ve got a dumb question with very little depth. Is Matt packing his clubs on his right side now? I thought he was lift handed?